Hey, did you know July 1st is the start of Christmas in July?? How cool, I mean how hot is that! Lol! This is such a fun time of year where you get a head start on Christmas holiday crafting and actually enjoy creating something lovely without that rushed feeling! Yay!!!! 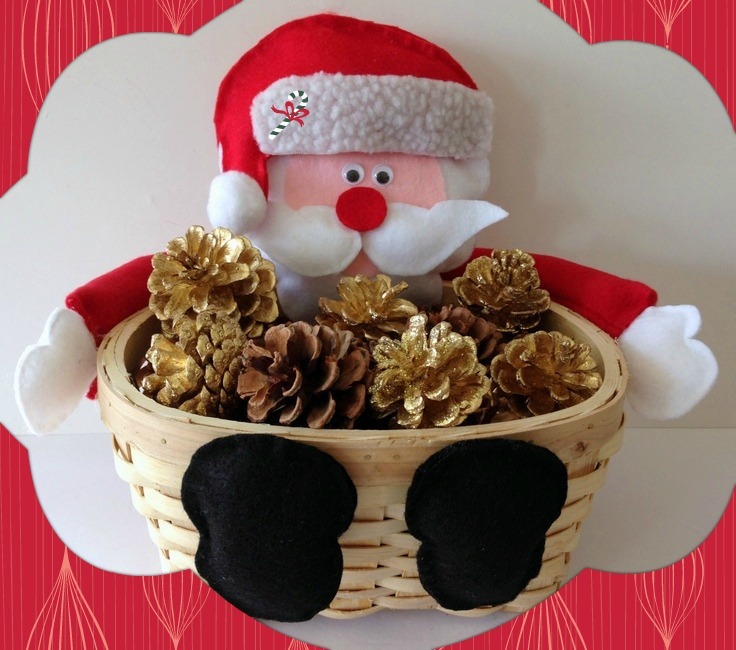 So, I'm sharing with you how to make an adorable No-Sew Santa Basket that's great for holding all things Christmas! And you know we all need something like this around the house during the holidays! Copy and paste templates, enlarging to full page in Word. Then, cut out all the pieces required in felt. Beginning with Santa's Beard pattern, run fabric glue along the edge, leaving an opening and pressing together both pieces, applying extra pressure around the edges. Let dry. Lightly stuff with poly-fil and add fabric glue to open edges and close. Clamp edges to seal and let dry. 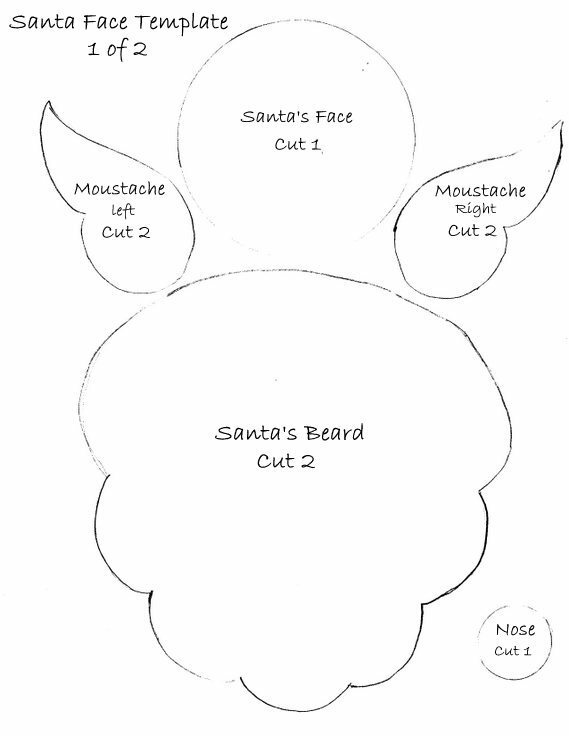 Add glue around edges of Santa's Face and apply to center of beard. I also tried another type of fabric glue - Liquid Stitch, but I like Fabri-Tac the best. Continue gluing the pieces of the face together - the moustache . . .
letting it dry and then lightly stuff. Next, glue moustache pieces together onto face. The nose next . . .
For the hat, glue on the cuff trim to the hat form, let dry, and then add glue to the edges, leaving an opening on the bottom cuff edge. For the arms, measure half around basket for the length - in this case, 16 inches. Cut felt five inches wide and 16 inches long. Fold over, right sides together. Apply glue to long edge, sealing together, let dry, and turn inside out. Lightly stuff length. 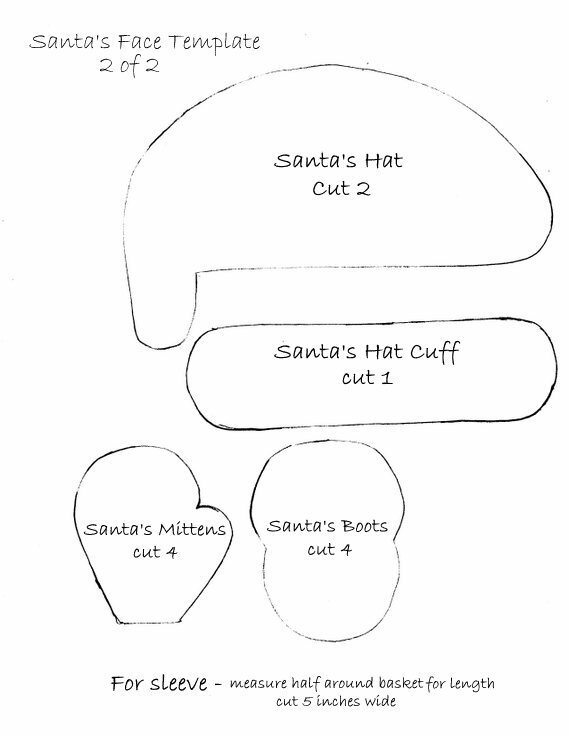 Glue edges of Santa's Mittens, leaving an opening, light stuff and glue open edges close. Insert mittens into ends of arms, gluing edges of arms and pressing together. Clamp ends together to dry. Hot glue arm with mittens onto basket. Glue head onto center of basket and arms. Add fabric glue around edges of Santa's Boots, leaving opening and lightly stuff. Close open edges with glue and let dry. Hot glue boots onto front of basket at edge. 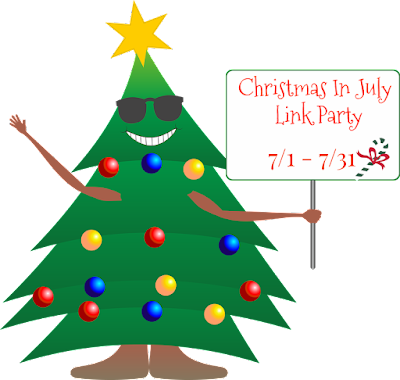 What a fun Christmas in July DIY craft project! I hope you enjoyed this easy to follow tutorial! I'm part of a group of talented ladies who have put together a Christmas in July Link Party featuring Christmas ideas. Please visit each and everyone for their awesome Christmas creations and don't forget to link up your favorite Christmas projects, too! Gail, your Santa Basket is adorable! I love it. The pattern is great-I'll definitely be using it. This would make a fun decor piece to hold Christmas cards. Pinning! Thanks, Beverly! That's a great idea I didn't think of! I love this basket! It's super cute and such a clever Christmas idea. I love that you have pine cones in the basket. I like to have a basket of scented pine cones out during the holiday season, and this basket is perfect for the pine cones or Christmas candy! I'm pinning this! This is super cute. It's a craft that my grand kids can help make this year.